Miromatrix Medical is among the emerging biotech companies “Making BIO History” at the 2018 BIO International Convention, June 4-7 in Boston, Mass. CEO Jeff Ross, Ph.D. will present on The Future of Bioengineered Organs and Miromatrix’ vision to eliminate the organ transplant waiting list on Wednesday, June 6 at 11 a.m. in Theater 1. “It is an honor to have Miromatrix selected to present at BIO and share our ground-breaking technology with investors and companies in the biotech, pharma, and medical device space," said Ross. Sponsored by the Biotechnology Innovation Organization (BIO), the convention is one of the largest gatherings representing over 1,100 biotechnology companies, academic institutions, state biotechnology centers and related organizations across the United States and in more than 30 other nations. It provides biotech organizations the opportunity to gather together, learn from one another and advocate for the global biotech industry. Check out Dr. Ross' overview presentation in the link below. Miromatrix is pleased to announce that it will presenting at the annual Cell & Gene Therapy Investor Day hosted by The Alliance for Regenerative Medicine (ARM) on April 17, 2018 in New York City. This gathering will provide institutional, strategic and venture investors a chance to learn more about Miromatrix and our vision to eliminate the transplant waiting list. LeapMag has published an article focusing on the medical field's efforts to solve the world's organ shortage problem. This is a great overview of different approaches to creating life-saving solutions and our role as the leader in these efforts. "Much further along, and less ethically fraught, is a technique in which decellularized pig organs act as a scaffold for human cells. A Minnesota-based company called Miromatrix Medical is working with Mayo Clinic researchers to develop this method. First, a mild detergent is pumped through the organ, washing away all cellular material. The remaining structure, composed mainly of collagen, is placed in a bioreactor, where it’s seeded with human cells." LeapsMag was created by Leaps by Bayer, a new innovation initiative whose mission is to “aim for fundamental breakthroughs in the life sciences – ‘leaps’ that have the potential to change our world for the better.” Leaps by Bayer holds the conviction that ‘fundamental breakthroughs’ are absolutely necessary to conquer the most demanding challenges facing humanity. And that these breakthroughs will only be made possible by those willing to take risks and do what many think can’t be done. Medgadget, an online publication covering the latest medical devices, technology breakthroughs and discoveries, published an interview with Miromatrix CEO Jeff Ross, Ph.D. As Miromatrix gears up to demonstrate large animal survival with our bioengineered liver, Conn Hastings of Medgadget interviewed Dr. Jeff Ross about the whole organ program. Miromatrix is excited to announce that a pilot study to evaluate the effectiveness of MIRODERM to close difficult to heal diabetic foot ulcers (DFU) that had previously failed other advanced biologic therapies was just published in WOUNDS. The data demonstrated a >40% closure rate in 12 weeks with the average treated wound having been open for >2 years. It is a great article and the basis of our current multicenter prospective clinical study to further demonstrated the ability of MIRODERM to treat these difficult to heal wounds and provide innovative solutions to physicians and patients. 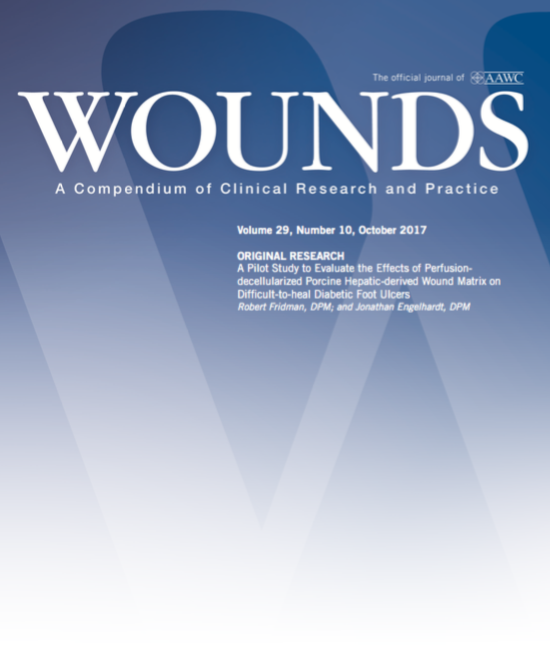 WOUNDS is the most widely read, peer-reviewed journal focusing on wound care and wound research. Wound care leaders and professionals look towards WOUNDS to provide them with the most current in research and practice in this complex field of medicine. The path to developing fully biological human organs has a number of major milestones. This includes demonstrating that our decellularized liver matrix can be re-endothelialized and then sustain in vivo perfusion in a large animal model. We are proud to share the recently published article in the International Journal of Transplantation Research and Medicine. Our ability to sustain in vivo perfusion of our re-endothelialized livers paves the way for our next milestone of rescuing a large animal with a fully recellularized liver. MIRODERM Biologic Wound Matrix is the first-and-only wound matrix derived from porcine liver. MIRODERM is manufactured using Miromatrix’s patented Perfusion Decellularization technology allowing the wound matrix to retain the intact extracellular matrix of the original biologic material including all vascular channels. MIRODERM is available in a variety of sizes both solid and fenestrated and is cleared for the management of wounds including but not limited to pressure ulcers, venous ulcers, chronic vascular ulcers and diabetic ulcers. MIRODERM received an innovative technology contract from Vizient and was awarded a federal supply schedule contract for government sales. Miromatrix, is a biotechnology company engaged in the development of fully biological human organs to solve the chronic shortage of transplantable organs, utilizing its patented perfusion decellularization/recellularization technology, as well as organ-derived biological products such as MIROMESH® and MIRODERM® for soft tissue reinforcement and advanced wound care. Miromatrix’ perfusion decellularization/recellularization technology is protected by a series of issued patents and pending patent applications in all major markets around the world. In addition to MIROMESH and MIRODERM, internal development programs at Miromatrix focus primarily on creating fully implantable human organs including livers, kidneys and heart products, with collaborators including The Mayo Clinic, Texas Heart Institute and Mount Sinai Hospital, and aim at eliminating the organ transplant waiting list.